Checking out the new book. Photo by Kate Samuels. As far as books go, I’m a pretty rabid consumer, and while I enjoy a book to read before sleeping, I also enjoy finding books that are educational in the realm of my equestrian endeavors. This book, World-Class Grooming for Horses, has completely and utterly skipped the line and become my favorite book of all time. If I said that I was exaggerating in this statement, I would be lying. 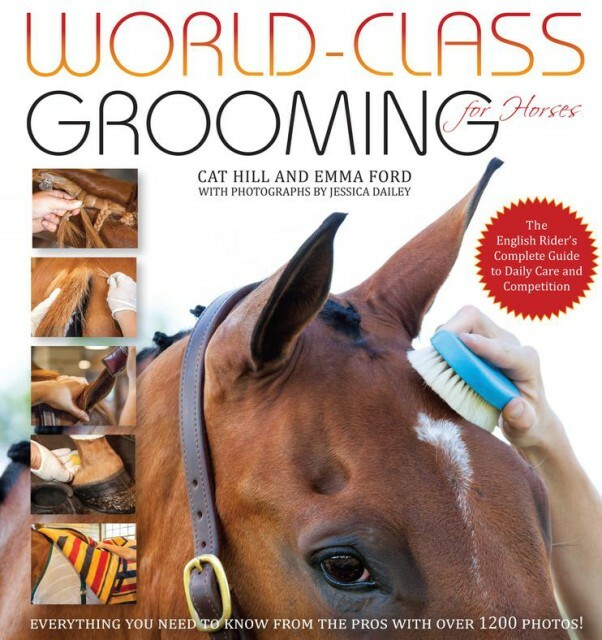 Written by the famed Emma Ford and Cat Hill, both of whom have been professional grooms at the top level for many years now, World Class Grooming is nothing if not comprehensive. The beauty of this book lies in the fact that not only does it give detailed instruction on the basics of how to beautify and prepare your horse for any situation, but the authors fully recognize that a beautiful horse comes from proper management techniques, and the perfection is in the details. With decades of experience between the two of them, Emma and Cat have outlined everything from the nitty gritty daily schedule of a working groom, to the proper way to cool out a horse after a workout, how to jog them up, how to clip, all show preparation and grooming, tacking for different disciplines, and tips on how to keep an eye on medical needs and leg soundness. 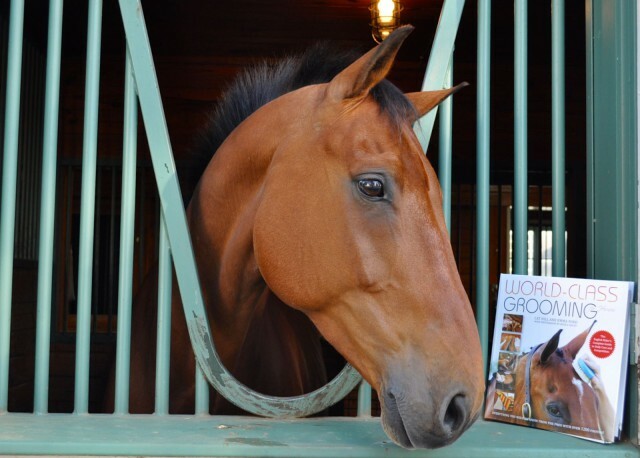 With 13 chapters and 218 packed full of info, there is little about the care and maintenance of a sport horse that you will not find within these pages. Photo courtesy of Trafalgar Square. 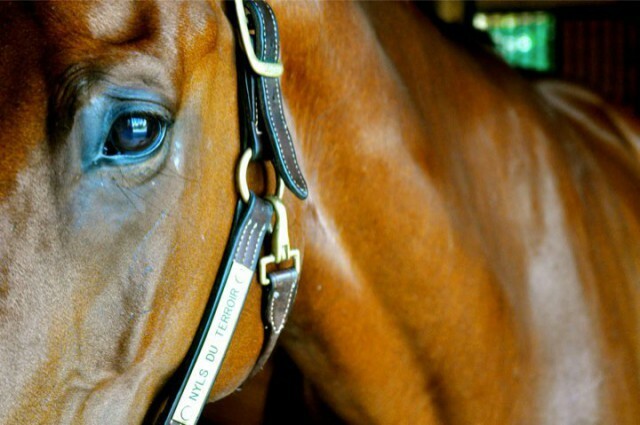 Yes, you will learn tips on how to make your horse look the most beautiful that it possibly can look on any given day. I learned to try a little baby oil in a bucket of warm water and use that on a rub rag to gather every little bit of dust on the coat. I also (finally!) mastered the shark’s teeth pattern for quarter marks, which I’ve been dying to learn for ages. I’m itching to try out the techniques for hunter braids or even a hunter tail, as the way in which they illustrate the process is the only way that I’ve ever found to make sense. One of the best aspects of World Class Grooming for Horses is the photo illustrations, which the authors obviously spent years planning how to instruct even the most beginner of students in a way that’s easy to understand. Jessica Daily took the photos for the entire book and did an amazing job of choosing just the right way to show step-by-step visual aids for guaranteed success. With over 1,200 color images in the book, it’s hard to not be taken in by the beautiful photography. You will learn how to take care of a horse at Rolex and hear the story from Emma about the poultice disaster of 2008 with Connaught after cross country. Cat shows you how to tie a fake tail in, and they both explain the multiple different ways to ice a horse and wrap it properly depending upon different needs. There is advice on the application and necessity of different studs, trailering preparation and tips for tough shippers, how to fold a blanket just-so, and how to polish brass until you see your reflection. This is not just an instructional book, but a book that is filled with advice well rooted in personal experience and tried and true methods. A really fun aspect of it is the “barn gossip” sidebars, which I thoroughly enjoyed. These are personal stories from both Emma and Cat filled with names of horses that we all recognize and real-life situations that caused them to learn important facts about horse care. I learned things about Mara DePuy’s Nicki Henley and many of Phillip’s four-star mounts that I would have never known, and it humanizes both the caretakers and the horses that we see on the international scene. Showing off that sheen. Photo by Kate Samuels. This book is one of the best instructional manuals I have ever read, because even though it is comprehensive and detailed, it is incredibly easy to digest and understand each part. The authors clearly have history as teachers, and it shows in the way that they explain methods with just enough detail. I rabidly consumed the book in one sitting and have since then gone back and re-read certain sections, learning more with each sitting. The most important part of World-Class Grooming for Horses is the opportunity to learn at the feet of two of the greatest women in their profession. These are women who know how to run a top class barn, organize everyone and everything, and still find time for the important details in life. And, most importantly, they know that the horse always comes first. This means that everything we do as grooms is based around the quest to find a way to bring the absolute best out in every horse. As it is with riding, the more horses you care for, the more you know about how to do it with the most efficacy and efficiency. If you had to train a barn full of extremely inexperienced grooms and handlers, all you would have to do is have them read World-Class Grooming for Horses from cover to cover, perhaps a few times through. I can’t even express how many details and aspects of horse care went into the creation of this book, nor how approachable and instructional it was for me. It will be something that I recommend for years to come.